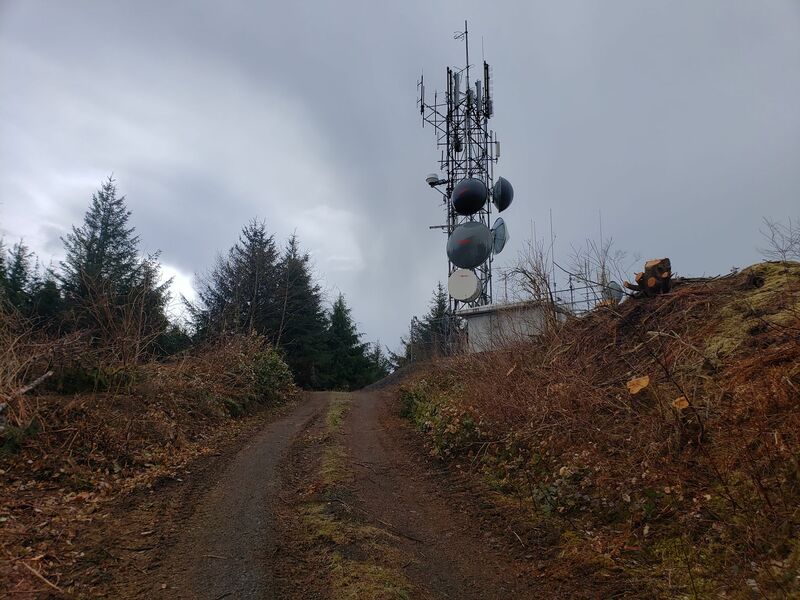 Summary: On 28MAR19 I decided to knock out the first activation on Field Effect Hill (aka Megler Mountain). The weather started out beautiful and sunny but I ended up having to complete my activation in the rain which contiuned until I had started the hike back down when the sun returned. 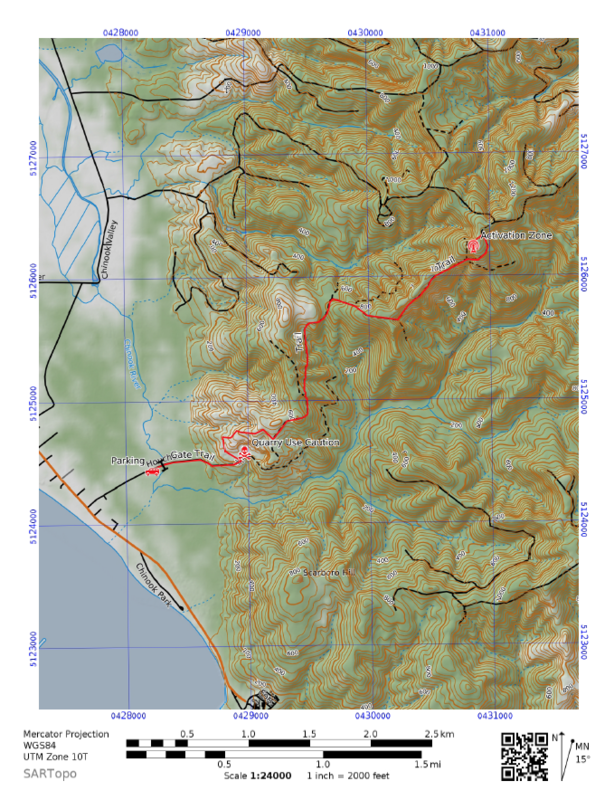 Overall, the hike isnt bad but the the horrible wide band RFI in the vincinity of the summit made this less fun for an HF activation than most summits which tend to be far quieter. I experinced an S9 noise 'floor' on both 20/40m up near the fence line for the tower and had to move around to find a spot in the activation zone that would give me a workable S5 noise floor. I didn't try it but I suspect this would be a great site for a 2m activation as you can see the chinook/illwaco area, Astoria, and up river towards Mount Hood. 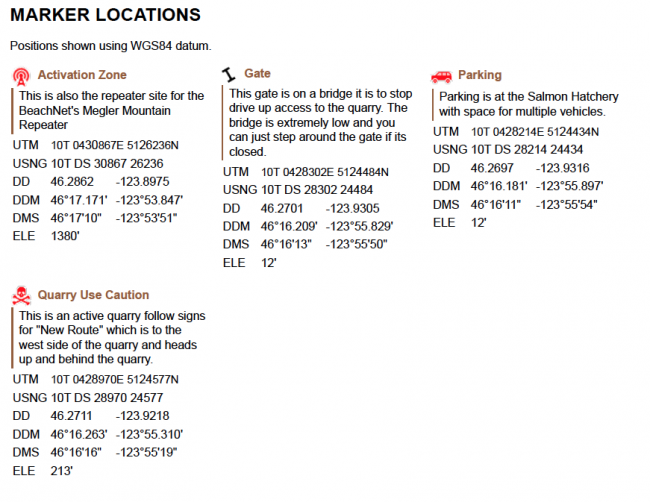 Permit: Non-Motorized access to this site requires a free permit from GreenWood Resources (Lewis and Clark Timber) which can be aquired off their website: https://permits.greenwoodresources.com/PermitHome.aspx Once signing up for the permit you can print it out and it than must be on your person at all times when on their property (Note: This permit is extremly useful as there are multiple summits in the W7O/NC region that are on their property. 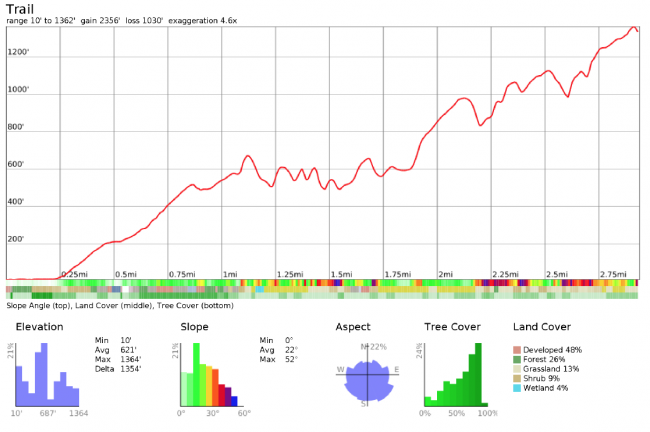 Trail Summary: The trail from the parking area to the activation zone is 2.94 miles long with 1354' of elevation gain. The portion between the parking area and the quarry are paved with the remaining trail being on well maintained logging roads. 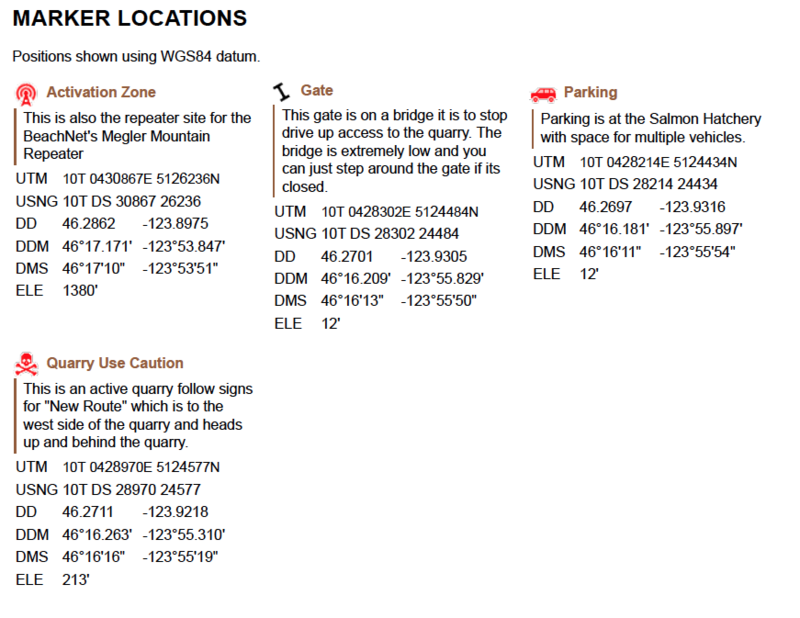 Route: After parking at the hatchery continue East on the road over the small bridge past the gate marked on the map. Follow the road to the large rock quarry where you will see signs directing you to the 'New route'. Follow these signs skirting counter clockwise around the western edge of the quarry and follow the road that goes up and behind the quarry. From there follow the map provided (Google Maps will also provide workable directions once you get past the quarry). Stay on the main road you are on and once you get to just below the summit there will be a 3 way split take the middle spit which goes up around the right side of the summit. Activation Zone: The activation zone is relatively large with some trees still i place and the eastern facing slope logged and not yet replanted. There is a large antenna site located at the summit and I would recomend getting as far from it as possible while still being in the legal activation zone to minimize the RFI issues this caused for me during my activation. Conclusion: This was a decent activation I was able to get 7 contacts on 20m but it was a struggle with the high noise floor. I would recomend trying it 2m as well just to see if the noise level is lower. The view is decent and the hike is easily manageable.